“Crossed” shows us what the four groups are up too, but leaves us with more questions than answers. 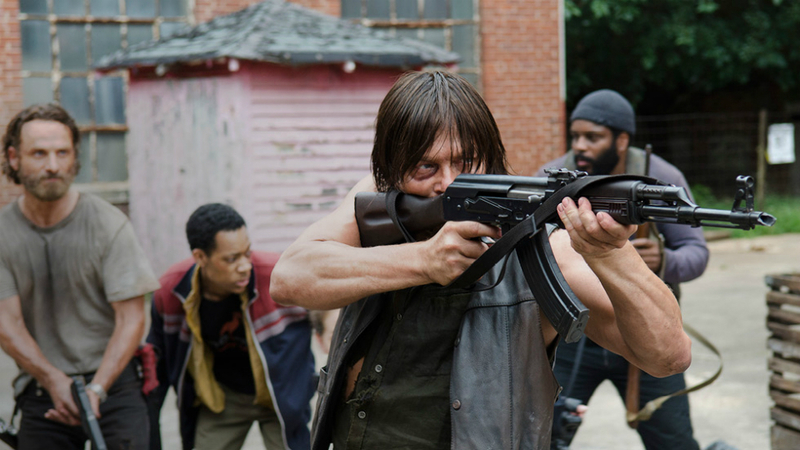 “Crossed” begins with the fortification of Father Gabriel’s church, picking up after Daryl and Noah had already briefed Rick’s team on Atlanta. Now that the locations of Carol and Beth are known, they must first turn what once was a sanctified house of the Lord into a fortress before heading out on their rescue mission. The organ pipes and pews were used for protection for the church. These not so subtle changes strike a bad chord with Father Gabriel. He almost breaks his fingernails trying to scratch the blood of the former crew of Terminus off of the church’s floorboards. There are a few moments where Carl tries to convince him to take up a weapon for protection, and Michonne tries to empathize with him, explaining that the things they do are for survival. But the good Father wants no part of it. He eventually escapes with the machete offered by Carl. From there, the episode bounces around. We first get a quick glance at Beth watching over Carol. Even though they get the least amount of screentime, it works. After Learner hands Beth the key to the drug locker in order to try and save Carol, she barters a few strawberries for a distraction in order to get Carol what she needs. Beth proves to us again how far along she has come in this world. We switch gears to Abraham’s team where Eugene is still unconscious thanks to the man himself. With Abraham refusing to do anything but kneel and stare blankly into nothing, the rest of the crew attempts to find additional sources of water. Maggie stays behind to monitor Eugene. The interesting thing about the crew is the varied opinions about Eugene. Glenn is pissed at him for lying this whole time, but Tara is impressed at his deception and feels okay with the fact he used the only skill he had to survive. Rosita gives us a different look at Eugene, explaining how he taught her survival skills. He was also the first person to say he needed her help. That storyline was a real cool way for everyone to speak their piece about Eugene, while letting Maggie and Abraham connect. Finally, we watch Rick’s group as they sketch out a pretty solid plan that focuses on stealth and speed. Tyreese, being more realistic, counters with a plan to capture some of the hospital’s cops for a trade. While the first phase of Rick’s trap is solid, it went south and gave us our gory walker moment of the episode. Seeing the people that should’ve been saved melted to the pavement and blown in half was pretty gross. However, it was made better by the cop vs. Daryl fight. Half of a melted walker crawled toward Daryl trying to bite him while the other cop held Daryl down. Then, Daryl shoved his fingers into the eye sockets of the walker’s skull, ripped it off and beat the cop with it. The ending part of that thread allowed Sasha to be taken advantage of by a guy named, of all names, Bob. It was a rookie maneuver that she should have saw coming. “Crossed” did a good job in showing us yet again how dangerous it is to trust people in this world, with several of the core cast suffering from misplaced trust. There were a couple of nice walker moments, but a lot more progression with the different groups of this season. However, very few questions were answered in this episode, which is always irritating. What did you think of “Crossed”? Will Carol wake up? Will Abraham forgive Eugene? Scribble your comments in blood below.